The Royal Garden Hotel in the swish London borough of Kensington has hosted World Cup winners before. In 1966, Bobby Moore's England paraded the Jules Rimet trophy from the balcony before an adoring audience. Yesterday, three countries completed another stage in their bid to become World Cup winners, as the race to become the host nation for the 2023 Rugby World Cup heralded what will be a defining few weeks before the winners are announced on November 15. Ireland, still the strong bookies' favourites - albeit one firm hardened them to evens yesterday afternoon - South Africa, and outsiders France delivered their final bid presentations to World Rugby council members. The bid teams from France, Ireland and South Africa were each given 30 minutes to present their hosting proposition before fielding questions. None of the questions would have surprised the trio and, likewise, none of the answers will have alerted the council members. This show has been on the road for more than a year now; yesterday was about peaking in terms of delivery and message. Already this summer, the three candidate unions submitted their full bid documents, which are currently being evaluated by the World Rugby Technical Review Group. This group will submit its report to the Rugby World Cup Limited Board, which in turn will make its recommendation to Council on October 31 prior to the vote on November. There are 39 of them up for grabs and every one of them will count. "There are always going to be swing votes," says Philip Browne, the CEO of the IRFU. "To be fair, all the people we visited said we'd really like to see what the outcome of the assessments are before they start promising their votes. I understand that and it would make a mockery of the process if they started offering their votes without seeing the assessments. "So a lot of them are playing their cards close to their chests. But we have a good sense of who we think has an affinity with what we are trying to do and say. We are in a reasonable state"
There has been horse-trading before; Ireland were roundly condemned by Asia and South Africa for allegedly switching their allegiance to New Zealand at the last minute in 2005, prompting legal letters all round. In an attempt to ensure transparency, World Rugby have employed consultants to expertly assess the bids, from which a recommendation will be made at the end of next month which, it is hoped, the voters will choose to rubber-stamp in November. The Irish bid is in the box-seat, for now; it is arguably theirs to lose. And, given that all three admitted in post-presentation press conferences that there was nothing new presented yesterday that hadn't been unveiled before, that still should remain the case. The powers of persuasion - and politicking - now become vital. Bid ambassador Brian O'Driscoll reported that the presentation team "peaked" yesterday; the presence of Leo Varadkar was key, particularly as French PM Emmanuel Macron was "too busy" to attend. The French have not always been on point during this process and there has been more than a whiff of (sporting) political in-fighting attached to their bid; hence, the decision yesterday to unveil the late Kiwi legend Jonah Lomu's two small boys, sitting atop the knees of Sebastian Chabal, once the world's most expensive player. It was all slightly crass. One of them, Dharyille, was born in Marseille and has, we were told, expressed a desire for the 2023 World Cup to be held in the country of his birth. From a country known for its variety of cheese, this grated the most. Equally ignoble was the impression that, for them, simply upping the minimum guarantee payment required of a hosting government by £30m would also aid their cause. "We've got to have it at any price," bellows Laporte in a video shown to council delegates. Money is, of course, a crucial bottom line in any process such as this but, even for a relatively minority sport, in a global sense, it is not the only thing. 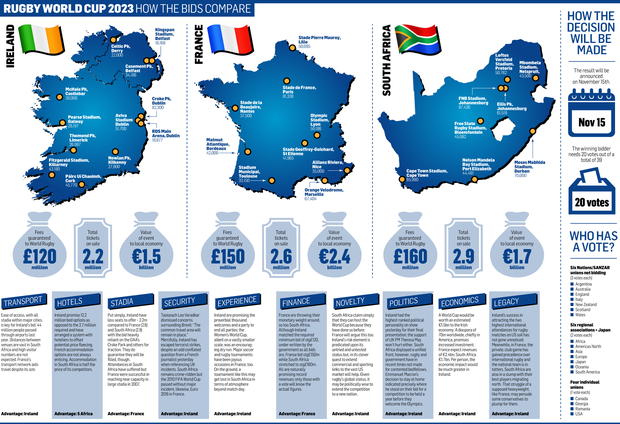 South Africa bid the highest of any in 2009 but lost out to England; World Rugby want more bang for their buck than just an immediate hurry-up in cash; they want guaranteed bums on seats, global sponsorship and lasting benefits. Ireland does not have as many seats as either of their rivals - and have needed the permission of the GAA to ensure their bid could have any chance of getting off the ground in the first place - but they do have a better chance of filling them than the other two. And, in harnessing the enormous US market via Irish-American CEOs, as well as multi-national companies based here, the financial package they have put together is believed to have made a significant impression on council members. All three have claimed that theirs offers the best financial deal but World Rugby will also be mindful of less tangible factors, such as legacy issues and the image of the game. This is where France may take a hit; Laporte, their union president has long been a divisive figure and is under pressure to resign due to a conflict of interest with chief bid sponsors Altrad, with whom he has signed a private business deal. Anything that may smack of FIFA-style scandal spooks rugby types so they would presumably never allow themselves to commit to a bid that may erupt in scandal down the line. The Irish government are fully behind the bid, although the joint south-north element is a tad stymied by the rather obvious fact that the north doesn't have a functioning government and were instead represented by the head boy in the Civil Service. In terms of pure politics, South Africa's bid stands out, with the memories of the 'Rainbow Nation' World Cup in 1995, when the newly-elected black president Nelson Mandela handed the trophy to the white captain Francois Pienaar, a picture perfect postcard of integration and unity. "That was an all-white team," said deputy president Cyril Ramaphosa. "In 2023 a diversified team will prove what Mandela said about rugby being the great unifiers, coming from very sad past of racial division and we will realise his dream of being a rainbow nation. "We believe if we were ready in 1995, we are more than ready now. Our country has been transformed and has changed for the better." 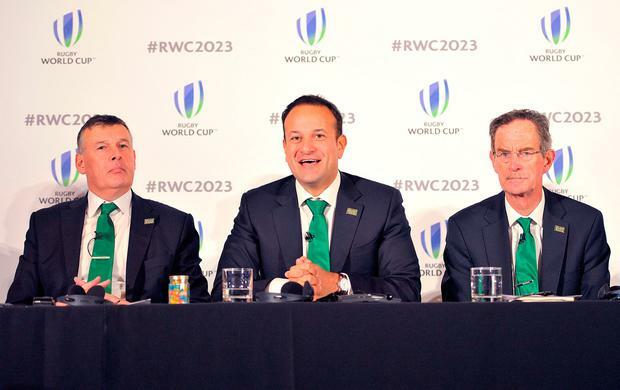 Hosting cricket and soccer World Cups in recent times hardens their case but, like France in 2007, theirs is also a very recent experience so World Rugby, always conscious of development, may view Ireland as the best option, hoping the financial certainty will outweigh any risk. "We think it's important," says Browne. "Some other unions think it's important too. "If rugby wants to be a truly global international sport, it has to spread its wings beyond the same old same old. "We believe we've a unique proposition. We are going to deliver the certainties around revenue that Rugby World Cup want. We're going to deliver new markets and a new host. We're going to provide them with full stadia. "We're going to provide them with a very different experience. We had 110,000 people turn up for the ploughing championships in a field in Offaly last week? In the rain. That's the reality." Ireland usually prefer being the underdogs when it comes to taking on the heavyweights. Now they are the favourites but, with their work virtually all done, much will depend on behind-closed-doors boardroom politicking which will be out of their control. "We wait with bated breath," says Browne, as a nation holds theirs.